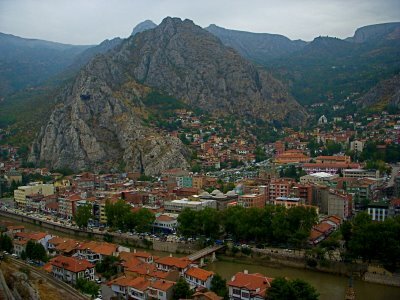 Amasya, a picturesque town that is located along the Yesilirmak river with mountains rising high above. The setting is spectacular, the compact narrow mountain valley produces an energy beyond compare. 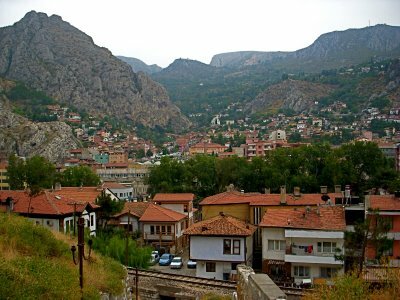 There are many picturesque Ottoman wooden houses that Amasya can boast and claim to be one of the most charming, delightful towns in Turkey. 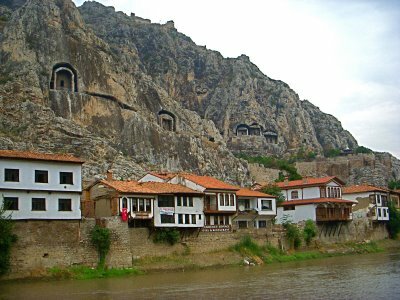 Dating back to the Hittites, Amasya changed into the hands of the different rulers of Anatolia throughout history. 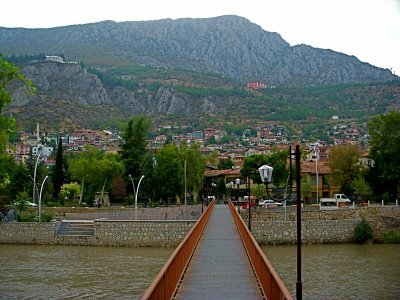 Alexander the Great conquered Amasya and Persian satraps ruled the area during the Hellenistic era. 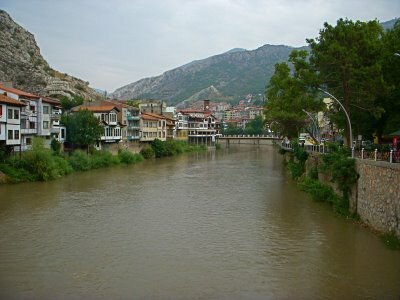 Amasya experienced the rule of the Romans in 47 BCE that ended the golden age of Amsysa. The Byzantines, Seljuks, and the Mongols conquered and ruled the land in secession. 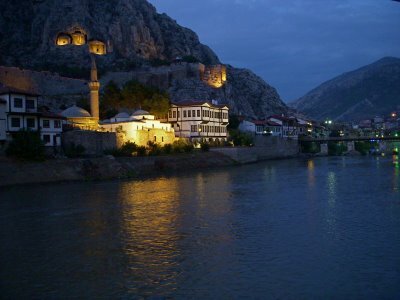 During the times of the Ottomans, Amasya became an important army base and an educational center for Islam. 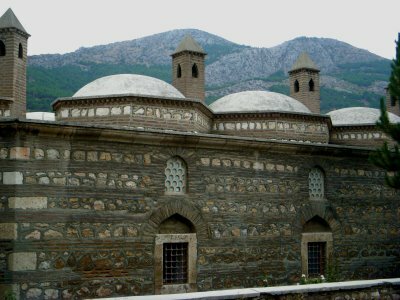 The octagon Buyuk Aga Medresesi (the picture below) that dates back to 1488 is still used as a seminary for boys who are training to become theologians for Islam. During the time of the third century BCE, after the conquest of Alexander the Great, King Mithridates II ruled the Kingdom of Pontus. 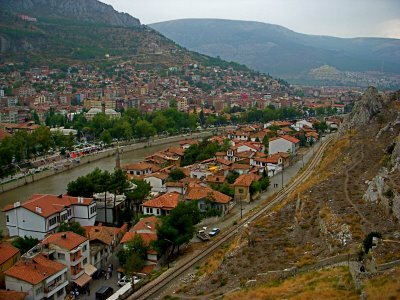 The Pontus kingdom set its capital here in Amasya. 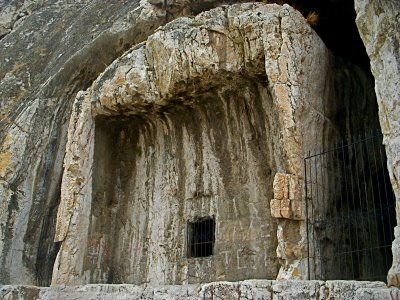 The Pontic tombs that are cut out of solid rock were used as prisons and a place for punishment. 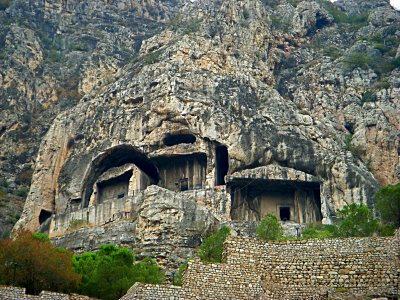 There are twenty three rock tombs along the Yesilirmak Valley, thus called the Kings Valley here in Turkey. The historic stories continue among this small town that is set among the mountains. An interesting story is that of man named Strabo, the worlds first geographer. 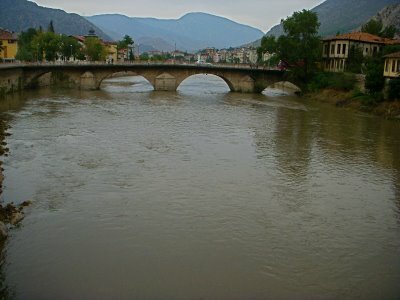 Strabo was born here in Amasya in the year 63 BCE. 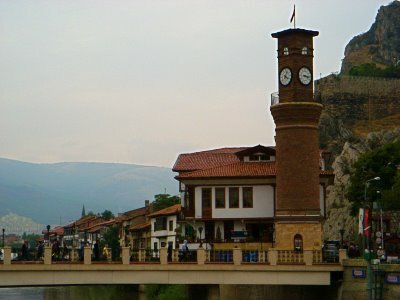 Strabo left Amasya to travel, and wrote close to fifty history books and twenty geography books based on his travels around the world. From the time arrived in Trabzon I have met some very nice people including a few girls. 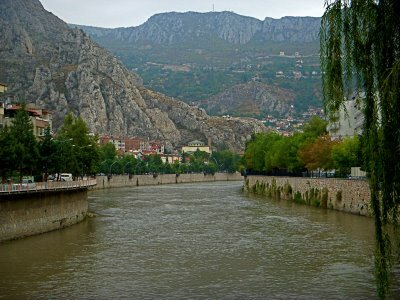 Today I met a nice Turkish girl from Sinop in a coffee shop, she is here in Amasya teaching, learning or playing volleyball—she only spoke a little English. The Turkish women since Trabzon are very attractive—there is much more freedom here in Turkey than the Arab world, although there still is the foundational culture, I don’t view the foundation as negative. What I have found interesting that throughout Turkey the young boys and girls wear uniforms for school—all the boys are in suits with ties. Throughout the countries I have traveled people are extremely impatient while driving. Many people drive much to fast—I have observed accidents occurring. There are many poor, reckless drivers around the world who are only focused upon arriving someplace instantly. In this part of the world people abuse horn—cars that are sold in the Middle East should not allow the horn to operate. Although there are much less driving laws than in the Western countries. Another common quality I have observed that is across the board is people slamming doors and expressing an inconsiderate concern for other people through noisy actions. However, the behavior stems from thoughtlessness, unmindful, a non-thinking type of frame of mind. The majority don’t think or consider if another person is sleeping—common courtesy causes good karma. The two subjects that are predominant is boredom and loneliness among humanity. Two subjects that the majority runaway from and avoid; however, striving to understand the context of boredom and loneliness is worth the time and time well spent. During Ramadan some conservative towns will have drummers walking through the streets at 3:30 in the morning bagging on the drums to remind to people wake up and eat. Some towns fire a cannon at 3:30 in the morning and at 6:30 in the evening indicating the time to eat. The noise that is projected from the prayer calls, horns, cannons and drumming in the middle of the night is very injurious to the central nervous system. However, this cultural will never figure it out; massage, yoga, acupuncture, and meditative silence is unheard of—caffeine drinking and smoking nicotine rule the norm. Another interesting subject that I have observed is that people are not willing to speak up and be assertive. An example is riding on the bus and the bus driver turns off the air. The locals will fiddle with the air vent and push a few buttons. As the temperature rises everyone will just sit and nobody will say anything to the workers. I get up and express myself, even if they don’t understand English, they do realize what I am referring about. If your traveling, don’t be fearful to raising your voice if needed. I have blown my top a few times and the people in the Middle East quickly listen, although I throw in a couple a laughs while I am expressing my anger. The emotion of anger is a tricky, sticky emotion. Indeed, anger can serve as a trap, although with balance and adding a bit of humor in the moment of anger the context changes. I will be heading to Sinop on Sunday. Next post: Sinop—The Black Sea Coast. Previous post: Unye—The Black Sea Coast.